Catalina, right off the southern California coast from Long Beach, ignites with wildflowers in early spring. 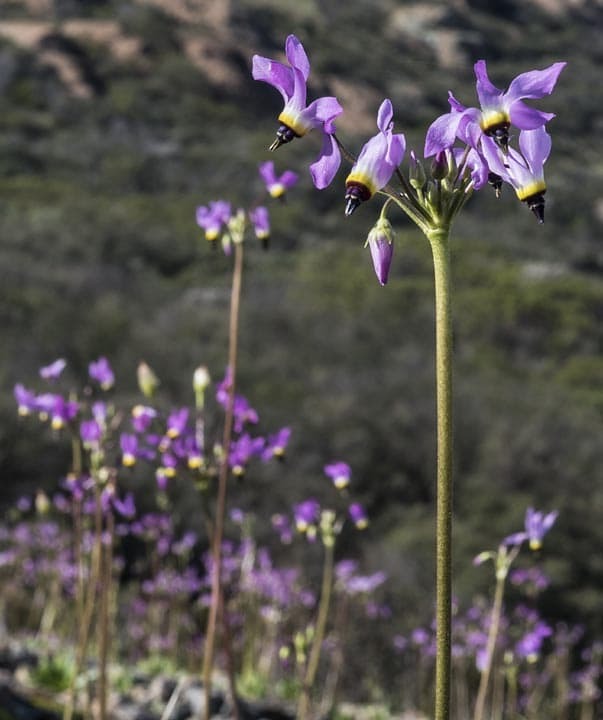 March is generally a good time to catch many of Santa Catalina Island’s 400 native plants in bloom, as well as its 180 or so non-native species. The color palette includes giant coreopsis, shooting star, Catalina wild apple blossom and island snapdragon. To see the color, you’ll want to book an inland bus or jeep trip through the Santa Catalina Island Company, your personal guide to the preserved areas of the island. The Channel Islands is a National Park made up of 5 islands – Anacapa Island, Eastern Santa Cruz, Prisoners Harbor (Santa Cruz Island), Santa Rosa Island and Nidever Canyon. The park is home to over 800 plant species (including subspecies, varieties, and forms). During a normal year of rainfall, the islands are green and wildflowers reach peak bloom around late winter and spring. Generally, the blooming begins and ends earlier the farther east and south the islands are located. The brilliant yellow coreopsis flowers usually peak between late January through March. The best viewing of these flowers occurs on Santa Barbara, Anacapa, and San Miguel Islands. Charmless Wilderness Park consists of 590 acres of the best of the Santa Monica Mountains Coastal Slope environment. The park includes shady picnic areas, majestic ocean views, eight miles of hiking trails, and an amphitheater. The wildflower Catalina Mariposa can be found at the park along with the delicate, pink-flowered wild cyclamen called padre’s shooting star. Charmlee is also a good place to find prickly phlox, bush lupin and hummingbird sage — flowers that are fragrant in addition to being beautiful. Tucked in the canyons above Malibu and nestled below majestic Boney Mountain, you will find Circle X Ranch. 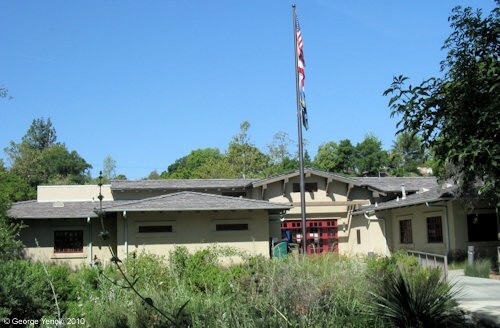 This former Boy Scout camp offers many opportunities for exploration and leisure. Hike one of the many trails that wind through this rare coastal Mediterranean ecosystem. Experience the ranch’s chaparral plant community and look for red shank chamise, a tree-like shrub with reddish-brown bark, clusters of thread-like leaves and small bunches of white flowers that bloom in July and August. The ranch also has a cave and waterfalls in its Grotto trail. 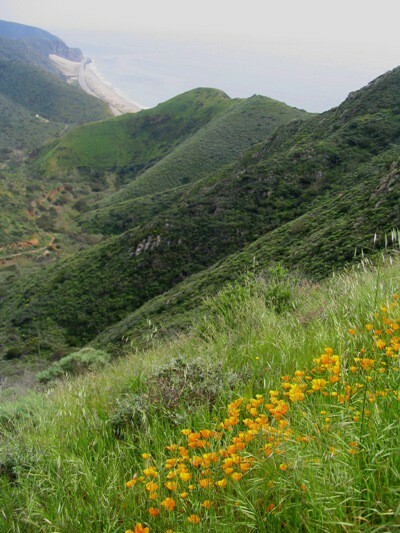 A coastal canyon of the Santa Monica Mountains where the creek flows directly to the ocean shore, Corral Canyon Park rests on a 100 acres of land and includes various hiking trails with gorgeous views. The Sara Wan Trailhead is a popular spot with a 2.5 mile hiking loop, and easy access to parking and picnicking facilities. The brilliant yellow flowers of non-native mustard dominate the open hillsides at Corral, along with the California peony, Indian paintbrush and gold-backed fern. Around Eaton Canyon Nature Center you’ll find plenty of blooming bush sunflowers and phacelias as you make your way into the canyon. And if it’s warm enough, you can dip in the waterfall at the end of the trail. 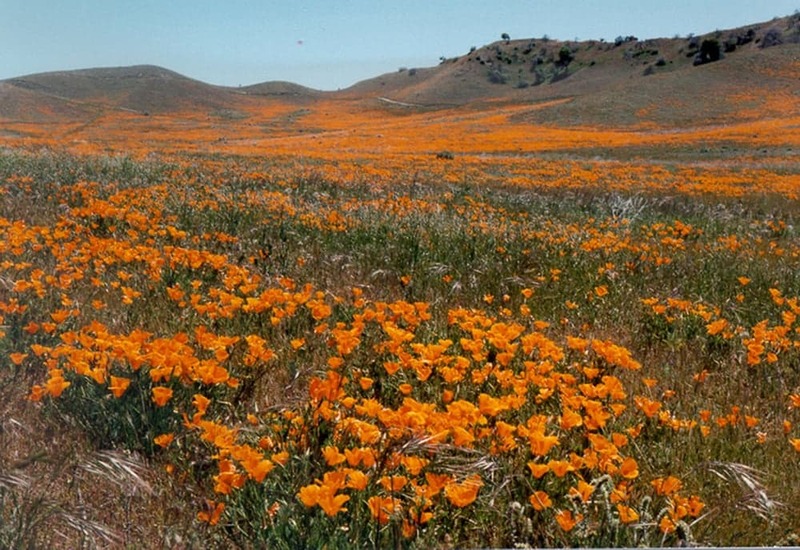 Not too far from the famous Antelope Valley poppy meadows there is another well-known location where in spring-time often there can be observed magnificent florescence of celebrated Californian flowers, the Flower Fields of Gorman Hills. Most common flower species here are the yellow California tickseeds, blue Bentham lupines, blue bluehead gilias and lacy phacelias. Orange accents are added by the beautiful California poppies in many places forming larger golden colored meadows. Public organisations have called for creation of preserve north from Gorman Post Road in order to protect the beautiful wildflower fields. 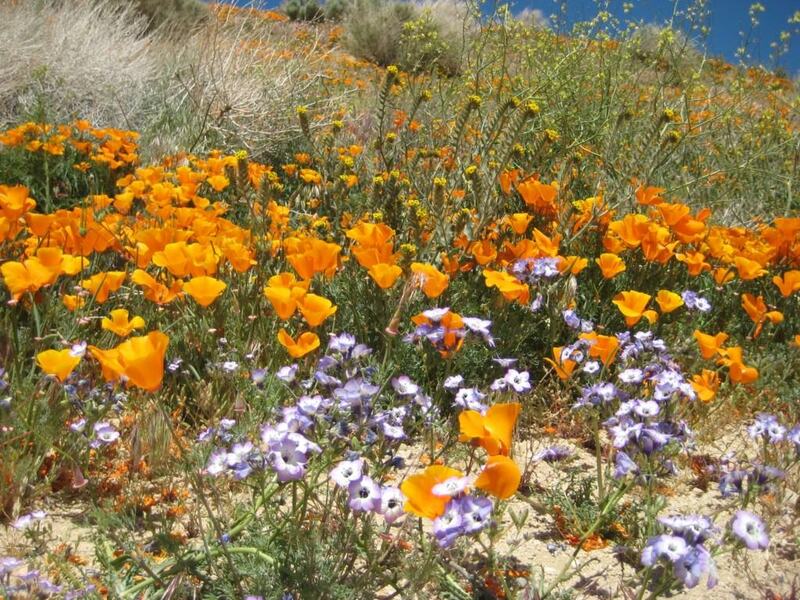 At Hungry Valley State Vehicular Recreation Area, you can catch a glimpse of the California poppies, goldfields, lupine, and tidy tips in Tejon Pass. There is a self-guided tour route and rangers are on hand weekends during the height of the season to provide two-hour tours. Hungry Valley State Vehicular Recreation Area / credit: Janet D.
In 1903 Henry Huntington purchased the San Marino Ranch, a working ranch with citrus groves, nut and fruit orchards, alfalfa crops, a small herd of cows, and poultry. Today, the estate is home to more than a dozen spectacular gardens spread across 120 acres. Head to Pasadena to see the camellias in the gardens in early spring. The green meadows at the Malibu Bluffs Park Open Space consists of blue dicks, yellow and orange deerweed, morning glories, pale orange monkey flower, the delicate tassels of purple needle grass and wild radish and mustard. The real star of the show at Bluffs is the Catalina Mariposa, a bluff-dwelling white and pink lily that is arguably one of the most beautiful local natives. At Malibu Creek State Park the best wildflowers are found in the oak woodlands south of Mulholland Drive in the northwest area of the park, along the road to the lake, and along Las Virgenes Creek in the northern Liberty Canyon area. From the campground, visitors will find easy access to oak woodlands over Tapia Spur Trail For a real challenge, visitors can try the Bulldog-Mesa Peak Loop. 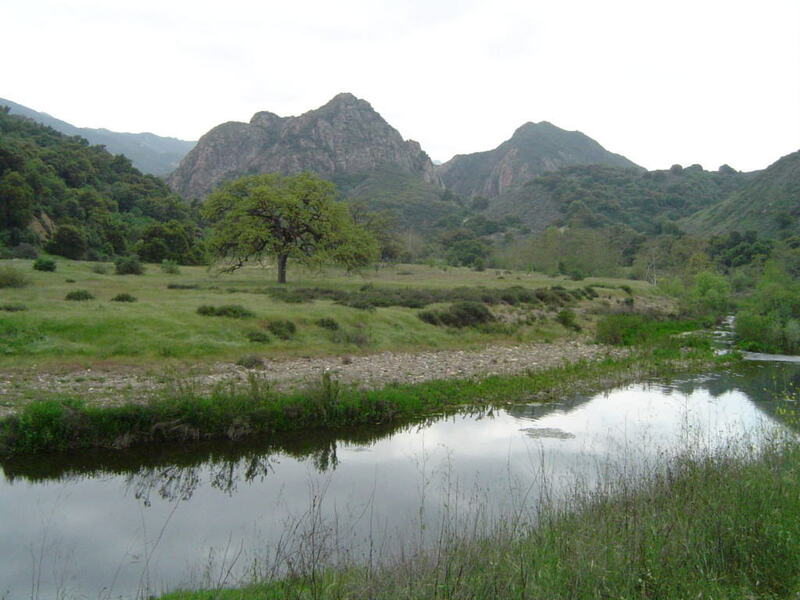 The Tapia Park section is a preserve of old oaks with a beautiful view of rocky peaks to the west, with wildflowers along the stream and under the trees. A trail that connects Tapia to Malibu Creek State Park has a variety of flowers and shrubs. On the Palos Verdes Peninsula, wildflowers bloom year-round thanks to its coastal location, but like most Southern California locations, March and April are peak months. In the summer, you’ll see buckwheats with soft white blooms, cactus, native milkweed, cliff aster and California aster. When Paramount Pictures leased the ranch in 1923, they began an era of film production that continues today. The ranch offers several miles of easy to moderate scenic hikes through chaparral, riparian, and valley oak savannah plant communities. You can easily see goldfields along the paths that are also visible from the parking lot. One of the most spectacular displays of spring wildflowers can be found at Point Dume State Beach, where the Point Dume Headlands and the bluffs along Westward Beach are golden with a mix of giant coreopsis — a flower found along the coast and nowhere else in the world — bush sunflower and California poppies. Patches of low-growing pale-purple sand verbena, wishbone flower, morning glories and evening primrose also grow along the trails. Visitors have a good chance of seeing sea lions, dolphins and whales, in addition to wildflowers. The popular La Jolla Canyon Trail gets dotted with giant coreopsis, floppy yellow daisy-like flowers. Purple lupine and mariposa lilies sprout on the hillsides and meadows, and mustard adds yellow streaks. You can also see golden poppies, blue lupin and purple phacelia in bloom in many areas. 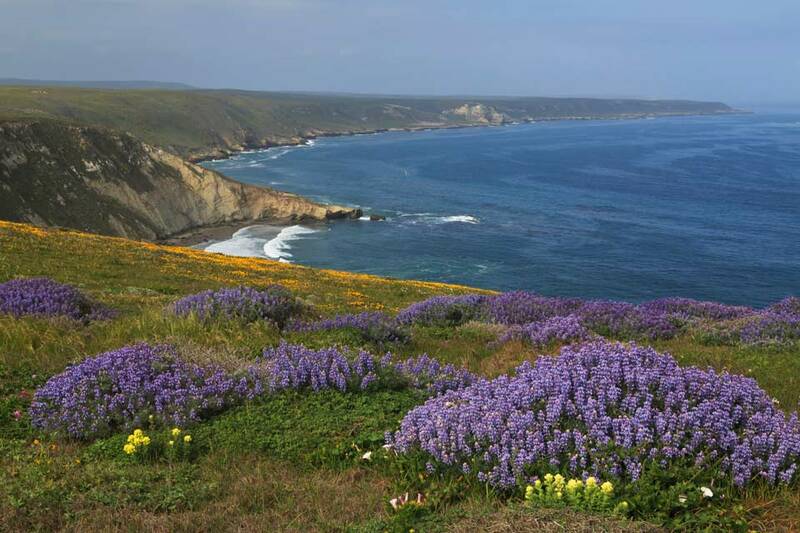 Hikers willing to trek up seven-mile Ray Miller trail at Point Mugu State Park to La Jolla Valley may be rewarded with a sea of lupin, in addition to spectacular ocean views. 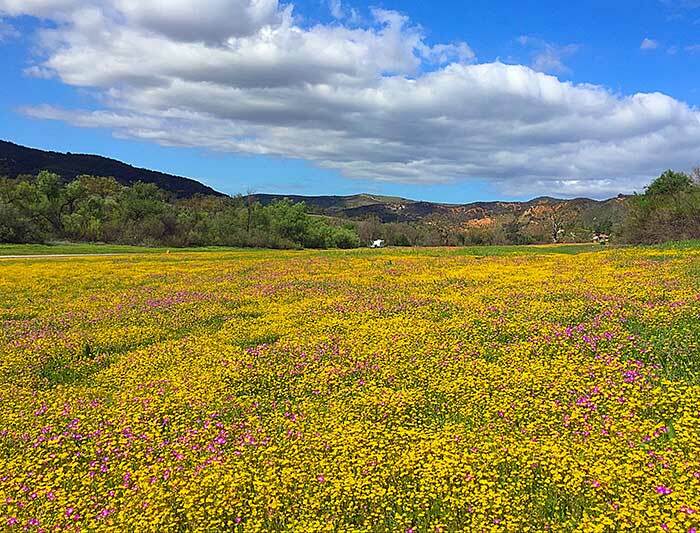 Saddleback Butte State Park is located 17 miles east of Lancaster, so it’s a bit of a trek from L.A., but you’re rewarded with lush fields of little yellow flowers. The state park surrounds the Saddleback Butte, a granite mountaintop 3,651 feet above sea level, on the western edge of the Mojave Desert. The best time to visit is in the springtime, February through May, when wildflowers are apt to put on a beautiful display of color. Solstice Canyon features several options for easy, moderate, or strenuous hikes through coastal sage scrub and riparian plant communities. Visitors can enjoy a picnic, a shady stroll along the Solstice Canyon Trail, or a more challenging climb up the Rising Sun Trail. Their perennial waterfall is a popular hiking destination, and along the way you might encounter acorn woodpeckers, alligator lizards, fence lizards, or a red-tailed hawk soaring overhead. The brilliant yellow flowers of non-native mustard dominate the open hillsides at Corral, along with the California peony, Indian paintbrush and gold-backed fern. Tejon Ranch is uniquely situated about halfway between Bakersfield and Los Angeles, east of the I-5 freeway. More than 200 species of birds have been spotted, a third of the state’s native oaks are represented, and more than 60 at-risk plant and animal species are protected here. 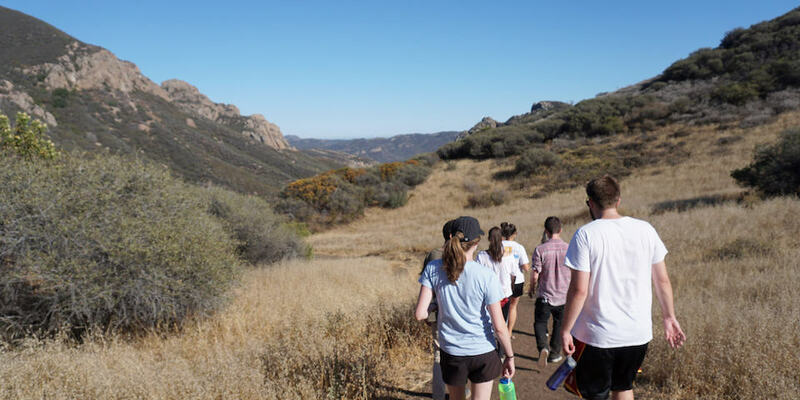 The Community Hike program is Tejon Ranch Conservancy’s primary means of providing access to the general public. Hikes typically take place in the Spring months with an emphasis on wildflower viewing and birding. 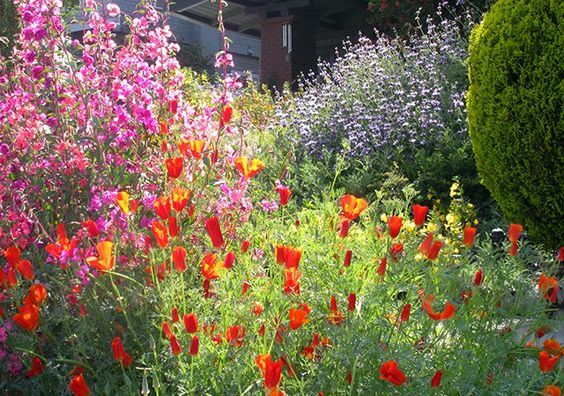 A gorgeous native plant nursery and garden in the northern San Fernando Valley. Browse the selections, talk to the helpful staff, and take a stroll along the Wild Flower Hill Nature Trail for some inspiration during peak bloom. Wild Flower Hill offers a ¾-mile trail just northeast of the retail nursery. The trail is open between 8:30 am to 4:00 pm on business days. It is an excellent place for hiking, birdwatching and picnicking. Common plants along the trail include Artemisia californica (California Sagebrush), Malosma laurina (Laurel Sumac), Eriogonum fasciculatum (Wild Buckwheat) and Salvia mellifera (Black Sage). Colorful spring-flowering species include Dichelostemma capitatum (Blue Dicks) and Delphinium cardinale (Scarlet Larkspur). The Theodore Payne Foundation also offers field trips for K-12 students with hands-on activities that teach students about California native plants and the natural world. The cost is $3.00 per student. Zuma! It is derived from the Chumash word for “abundance.” Certainly, Zuma and neighboring Trancas Canyons satisfy this description. The perennial streams running through these canyons give rise to an abundance of animal and plant life. Walk carefully along the trails and discover tracks of deer, rabbit and coyote and marvel at the profusion of springtime wildflowers. The brilliant yellow flowers of non-native mustard dominate the open hillsides at Zuma, along with the California peony, Indian paintbrush and gold-backed fern. Another member of the lily family, the chocolate lily, can be found in unusually large numbers in Zuma Canyon, along the trail accessed from the Bonsall Canyon trailhead. WOW, beautiful photo’s! I love seeing all the different wildflowers, they are so beautiful. I would love to visit LA one day soon. It really is a unique place to visit w/ so many places to visit. Oh what beauty at all these places with a bounty of flowers. I’d love to visit all of them but my first stop would be the Hungry Valley State Vehicular Recreation Area in Gorman. It is a perfect stop on the drive from SoCal to NorCal too. I spent 8 years in San Diego, so we’d go out to the desert to look for wildflowers. You have a good list here for the L.A. area. A lot of people wouldn’t expect to see so much fauna up there. I am actually going to the desert this month to see them too. Welcome to another SoCal fan! Wow! These places are stunning. I’ve been to Los Angeles 3 times but I have never seen this part of the city…I never really had any time to! Next time I visit my friend I’ll mention going to one of these places. Wildflowers are so beautiful. I love seeing them growing in naturally because they always sprout in the oddest places. They also make great landscaping pieces if you have space to allow them to grow.